After disease, humanity’s deadliest scourge has always been hate… hate has killed hundreds of millions. It knows no season and no limit. It is irrational and it is deadly. It is in us all. And it will live forever – unless we choose to stop it. It is really sad now because of certain incidents like in politics, the whole party is blamed., in religion, the whole religion is blamed., in bombings, the whole country/ race is blamed and so on. There is just so much hatred around nowadays especially on social media, friends telling each other to hate or boycott or demonstrations and so on. Not all Jews are evil, not all Muslims are evil, not all Christians are evil and the list goes on... I will be the first to admit, not all of them are good either, but don't let just a few bad apples spoil the whole basket. There are still a lot of innocent and people who are grouped together in this so called hatred for no good reason. Please stop the hatred. The world is getting more intolerant it seems, instead of being more tolerant and helpful. At this moment, (after the politics have kind of simmered down), the focus is Palestine. Of Gaza getting attacked and the evil doings of Israel. I agree, there are so many poor victims and so much evil people doing these evil deeds but NOT everyone there is that evil. There are also a lot of victims from both countries. And for no reason even footballers are being currently target for hatred just because of their belief!!! In my travels, I have met a couple of Isrealis, and I find them to be nice, peace loving people as well. It is the same for all of us. In every race, religion, country, there are crazy people who don't hesitate to do bad and evil things to others, but there are also a lot of good one who wants a happy and peaceful life . Let us stop the hatred and instead build bridges of appreciation, tolerance and understanding of persons of all religions, races, cultures and ethnic backgrounds. Let's try make this world a better place, stating from our own backyard. Let's help our friends, our neighbours and whoever we can, irregardless of religions, races, cultures and ethnic backgrounds. You have the right to be wary as not everyone is sincere or good, but don't let it stop you from doing whatever good you can. My heart bleeds for the poor victims of homelessness, of war, or injustice, and so on, but please don't make it a reason to "group" everyone together to hate. Please remember that even in our own families sometimes, there is a black sheep and it doesn't make the whole family bad does it? 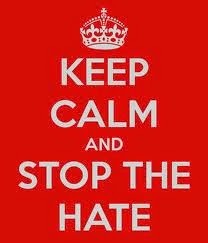 Let's keep calm, pray for the victims, help out however we can and please, stop the hate!!!! Spread peace and love.